By Adele. Arranged by Derek Hasted. Score, Set of Parts. 16 pages. Published by Derek Hasted (H0.548598-215543). Derek Hasted writes "This arrangement of Adele’s classic hit has some awkward rhythms in the flute part, but you can bend the rhythm slightly against the metronomic bottom part. Much of Adele's improvisation at the end of the track is captured here, unlike some other published editions. The Guitar part is straightforward though the first beat is often written to come early - at the back of the previous bar or measure. A Capo is required at the fifth fret, but this makes the part much easier on the fingers. The metronome mark is close to the speed of the original, but as an instrumental, it also works if you go a little slower, especially if it makes for a tighter performance. The parts are laid out with extra sample pages at the front so that you can preview some of each part and some of the full score on screen before purchase. I hope you enjoy playing this piece!" 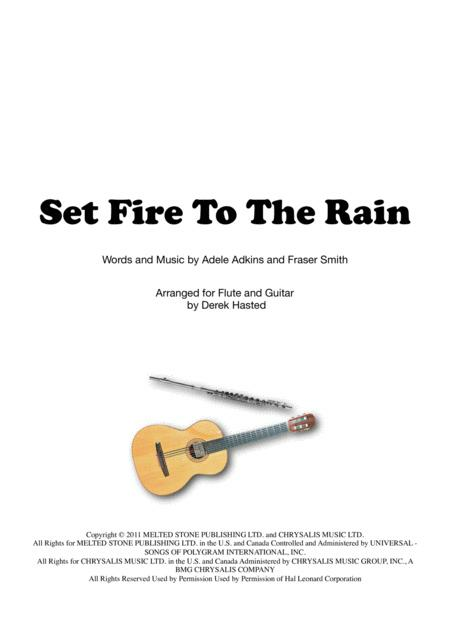 This is one of a growing range of accessible ensembles from experienced arranger Derek Hasted, and is supplied as full score and parts. Check out Derek's other arrangements - search SheetMusicPlus for Derek Hasted and you'll see the full list, all with soundclips and sample score.